I can't choose between them, but I can't keep them all. The vampires in my kingdom want me to crown my prince or give up the throne. Duty and tradition demand I let three of them go. My mother warned me not to fall in love with them. Now my only option is to play the game and try to come up with some way to get what my heart desires. Felicity has decided that she's not willing to give up any of her men and she's choosing to keep them all. Her mother brings her with her human consorts back to her home keeping them safe in one of the wings. While she has no intention of giving them up her mother is determined that she needs to pick one before it's too late. Keeping the guys safe may be harder than she planned as their blood calls to all the vampires in the residence. Especially when her cousin is looming in the shadows willing to swoop them up at the first chance. I like Felicity a lot she's willing to risk it all to keep her men together and not be forced to choose between them. Keeping the men safe doesn't look like it will be as easy as they have hoped since already things have changed. Hopefully, she can get her guy back before things get worse. I'm curious to finish the serial and see how things are going to play out for our vampire princess and her future princes. I've become an addict when it comes to the Reverse Harem concept the relationships all just work so well together. I think I find it so fascinating how the relationships all work out, it's not something you see every day in modern society. 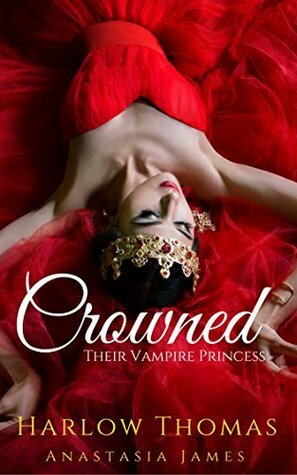 Crowned is the 2nd in the Vampire Princess serial it takes off right after the first one ends after the choosing has ended. I truly enjoyed the authors storytelling another installment I couldn't put down and I have to know how it's all going to finish. I've got the rest on my Kindle and plan to finish them soon. The concept is interesting, and the characters are easy to connect with and you can't help cheering them on. It's a steamy fast-fast paced story. Highly recommend checking them out.